Brian Shiro at his PTWC office (Courtesy of Brian Shiro). 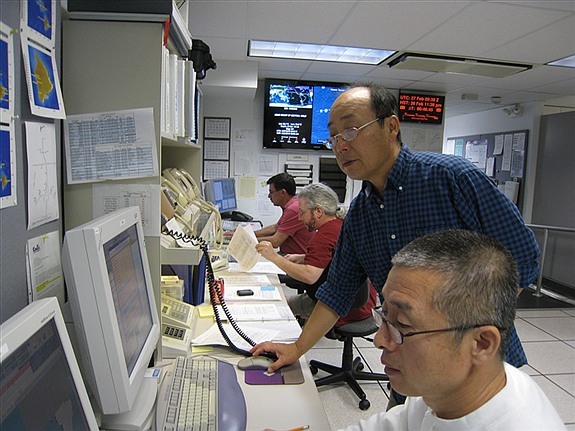 Brian Shiro is a geophysicist who has been working at the Pacific Tsunami Warning Center (PTWC) for over four years. 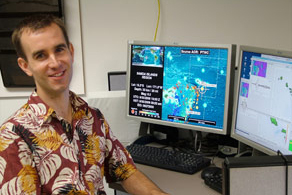 On a normal work day, his tasks go from checking that the warning system works to maintaining the center’s website and working on expanding Hawaii’s seismic network. But last weekend, after a 8.8 magnitude earthquake hit Chile and a Pacific-wide tsunami alert was issued for the first time since 1964. Brian spent about 40 hours working (almost) non-stop at PTWC. In total, the center issued 27 tsunami-related messages over the course of the event; the first one on Friday evening (Hawaii time) and the last one, calling the warning off, near midnight Saturday night. Brian took some time yesterday to tell us about his experience during the emergency. For two nights and a day, he was fielding calls from the media and public, and pushing tsunami scientific and safety information out on the Web via emails and social media sites, such as on Twitter. A: Yes, I had gone home a couple of hours earlier from work to spend the evening with my family. When I initially got the call back to the office to fix something on the website, I didn’t at first expect the tsunami warning to be as major as it was. But as soon as the magnitude of the threat was obvious, I ended up staying there and helping. The whole ordeal for me was from about 9:30 PM Friday night to 4 PM Sunday afternoon, because after staying there to help on Friday night and Saturday, my “real” shift started early in the morning the next day. Q: Were you working all the time? A: I took a small break on Saturday afternoon and tried to take a nap, but that was the time when the tsunami was arriving in Hawaii, so I stayed glued to the news coverage like everyone else. I was on standby duty for the evening during the latter hours of the warning. Being on standby is like being a fireman for tsunamis: you can be at the center and watch TV, take a nap, etc., but you have to have the pager turned on and be ready. We are usually on standby two days a week. But this time, I ended up working the whole time. Q: You wrote that during this time you were answering emails, handling media requests, and also monitoring social media between media calls; why did you think it was important to pay attention to what was happening on Twitter? A; Well, to begin with, if I hadn’t been monitoring the emails, I don’t know who would have. We had a lot of emails coming in, and no spare people to answer them. Also, we were all sharing the load with the phone calls. About the social media: I am the youngest person in here. I am very interested in social media right now, so I’m going to be looking at it regardless. It’s partly a generational thing. But I also believe social media has become such an important means of communication right now; it’s a good way to have a connection with people, even if you’ve never met them. It makes sharing news more participatory. I was [tweeting] unofficially, since we don’t have official Twitter accounts in the center. So I was just speaking for myself; I was trying to say all I could, whenever I could, but I had to be careful only to disclose information we had already made public. Sometimes I was trying to correct misinformation like when a rumor was spreading that a 35 foot wave was going to reach Hawaii. Q: What kind of information requests did you get from social media and from good old-fashioned calls and emails? A: We still get the most requests by phone, and email is also a big way people contact us. Since we don’t have an official presence on social media, people are not going to go there to look for us. But some journalists saw my tweets, and I got some interview requests through that. We get the most phone calls from journalists, with all types of information requests. At some point, every local media outlet had its van parked here and was broadcasting live from PTWC. Besides the media calls, we got calls from concerned people, who were trying to find out what to do. For example, there was a man who called saying that his daughter was in the Galapagos doing research when the Chilean earthquake struck, and he didn’t know how to reach her. He asked if we had heard anything about it, and I told him that yes, that people in Galapagos had been evacuated. Once the attention was on Hawaii, we got a lot of phone calls from local people asking what to do; “shall I leave my house, how high should I go?” We were trying to tell people not to panic, telling them “as long as you don’t go into the water, you’ll be OK.” We were trying to dispel some of the hype that was going on out there, but at the same time trying to take it seriously. We knew Hilo and Kahului bays were going to get the highest waves, and were most concerned about them. Q: How was the evacuation? Were Hawaiians well-prepared for a tsunami emergency? A: It was a big success story: there were no major gridlocks on roads as some people feared. Hawaii had tsunami evacuations in 1986 and 1994, and both times there was gridlock on the roads, which means that if the tsunami had hit, the cars along the coast could have been washed to the sea. So we try to tell people not to get in the car and just to walk to higher ground. Also, hotels and resort areas were very well-organized, knocking on doors and telling people what to do: either to go to higher floors or to evacuate, depending on the hotel’s policy. The police worked on closing some roads, and there were buses busing people out in some areas. On the other hand, some people evacuated when they didn’t have to, because they were outside the danger zone. We still have some work to do getting information out there. But overall, this event served as an excellent end-to-end test of Hawaii’s tsunami warning system: from the earthquake detection and tsunami inundation models that we do to the organization of the evacuation by civil defense authorities. Q: What are Hawaiians saying about the decision to evacuate, despite the fact that in the end there was a tsunami no-show? A: The reaction has been overwhelmingly positive: we’ve got many emails and phone calls, as well as people coming up to us in the street, recognizing us from TV, and saying “thank you for your good work”. That’s the good news. We’ve also gotten some criticism from people saying the warning shouldn’t have been hyped as much as it was. Of course, that was somewhat out of our control. We never said there would be a huge tsunami but that there was a potential for danger. We kept telling people that most places would see 1 meter (3.3 feet) but that Hilo and Kahului could see up to 2 or 3 meters (6.5 to 9.8 feet). It ended up being about half or so of what we expected… which, in this business, is actually pretty close. Part of the reason for the evacuation was that the tsunami warning system is set up conservatively, so that you can make sure you never miss a warning when it’s needed. There is always a danger of crying wolf, but we hope people realize we’d rather err on the side of caution to keep them safe than hedge our bets that an event might not be dangerous. This means you might overwarn, but that’s preferable to the alternative of underwarning. Q: (Radio host) Rush Limbaugh went even further and suggested that scientists are manipulative. A: There seems to be this theme going on with some people, and it’s very hard to refute because they have their mind made up that the government is withholding information from them. But this is not true: all the information we had, we put out there in the hourly warning messages we issued. If anyone wants to know what we said, they can look at them. The message can get spun different ways when it gets picked up by the media; we do our best to try to re-address it, but we have no total control on that. Also, Limbaugh’s comment on why we weren’t able to watch the tsunami with a satellite illustrates his ignorance about the state of the art: we can’t see tsunamis from space, at least not in a reliable, operational way that the tsunami warning system can rely upon. We might in the future, but not today. Our measurements of the tsunamis are only in the ocean, we gauge information as a tsunami passes by an observational buoy or coastal gauge. Brian Shiro at the 2009 Fall Meeting (Photo by Peter Weiss). Q: Why is it difficult to forecast exactly how high a tsunami is going to be? A: Tsunami forecasting is a very active area of research, and it’s improving rapidly. Especially since the 2004 Indian Ocean tsunami, because there has been more public awareness and more computing power. But still, there are so many assumptions that go into a forecast model. All we have to work with is that an earthquake happened in this location, and it was this big. Sometimes you can also say how the fault moved once you have the focal mechanism. So you put the information into a model and make assumptions: if the earthquake moved this way, how does it translate into seafloor motion? Then you have your equations of motion of the water that happened from this excitation, and these predictions are good in deep ocean. But when you get into shallower water, you enter a non-linear regime and you have to use different assumptions in your model. It is still difficult to predict the exact runup at specific location will experience due to uncertainties in the model, computing limitations, and lack of high resolution data availability. Also, the period of the tsunami is important too. A tsunami is actually a series of waves and the period is the amount of time between each wave. We were concerned about Hilo Bay because it’s notorious for amplifying tsunami waves: it’s just the right shape and size for tsunamis to fit perfectly inside the bay. The energy of the tsunami can’t dissipate in there, and when the next wave of the tsunami comes, its energy adds to the previous one, and the waves grow higher. Q: So what needs to be done to improve tsunami forecasting? A: There’s a lot of room for improvement. For starters, there need to be more ways to get the information out, so that there isn’t so much confusion when the prediction gets filtered through the media. For example, with social media we would have a way to control the message a bit better. Also, this tsunami has taught us some valuable lessons in how we can improve the modeling. And the modeling has become so important in our decision-making that such improvements are critical. Thanks to refinements that are already in the works for tsunami forecast models, this time we could have excluded some areas from the warnings. But for this event we didn’t exercise that, we just said that this was going to be large enough that everybody is at risk. As computing power gets better, the more complicated models that can depict in detail what’s going on near the shorelines are going to get better and better. Another big improvement will be having more data: one thing that delays us is having to wait for data to come in. Even when tsunamis travel fast, it takes them time to cross the ocean and reach detectors; if we had more detectors, we’d get the data faster and could have more accurate predictions.. I am optimistic that we will improve our ability to observe and forecast tsunamis in the future. Now we do the best we can with the information we have, which is actually pretty good. I would like to clarify a few points. For starters, I was one of about eight scientists who responded to the Chile earthquake and worked very hard for hours during the tsunami warning. Since I was not originally on duty and arrived just after the initial warning had been issued, the job assigned to me by the scientist in charge was to answer phones (and by extension emails). Others were more involved with the seismic analysis or tsunami forecasting for this event. Tweeting takes only seconds and does not detract from the activity assigned to me, and furthermore, I was able to respond to some people more rapidly that way than via email or phone, including people in NOAA and the USGS. More importantly, it was a good way to dispel rumors or further publicize information. As I said in the interview, I was careful not to disclose anything that wasn’t already public in one of our messages and tried to refrain from interjecting my opinions. However, it is very important to keep in mind that my tweets are mine alone and don’t represent any official position of the government. Study after study has shown that over the past couple of years social media has taken over as the #1 way people receive and discuss news today. Just like many of my colleagues spent considerable time on camera speaking to local news affiliates, I was helping get the message out over the internet. Most government programs now have active presences in social media, and in time I hope we will join them. If there are aspects of the job that you don’t understand like our required standby duty that we must do 1-2 days per week, I encourage you to come visit. I’ll even give you a tour myself. If you’re tweeting on the clock you are in the course of official duties and the tweets you send are the governments, and you represent the government. I’m not sure what the policies you have at PTWC, but in my world if you tweet on the clock it must be from an officially established account. Putting a “hey this is me not the government” doesn’t cut it. I agree with your recent studies that indicate that people receive and talk about news via social networking, but studies on emergency preparedness and management show that even in this decade people still PREFER to go to official sources/authorities in times of life safety related emergencies. Conflicting information, which twitter is full of, also is known to drastically reduce the likelihood that individuals will take protective action, which diminishes their time to respond. I like to think of myself as part of the “younger” generation and I agree with you social media can be a fast way of getting information out to a lot of people. Looking back at your tweets from the event a lot of it was totally not relevant to the emergency. (Saw one about Rush Limbaugh even) Posting lists of who you’ve done interviews with, or how long you’ve been on duty don’t come across as particularly professional when you indicate as intimately as you do that you are a Federal employee tasked on a team with a very serious task. Be careful, I appreciate your efforts, but from the sound of your blog you are really pushing the envelope of what is allowed under PTWC/NOAA policy, and perhaps even going beyond that, and I’ve seen things like that come back to bite. Thank you for offering this viewpoint. You are right that one must be careful and that this is pushing the envelope. Note that NOAA/NWS/PTWC does not have an official policy on tweeting at this time. We are in uncharted territory. Since the Rush comment has come up twice, I feel I must address it. That tweet was in direct response to another person’s question to me about Rush’s diatribe. I was merely responding to that person. Again, my tweets are my own thoughts and are not those of the government. Nice work, Brian. Seems to me that social media is an excellent place to get word out quickly in a time like that. If/when NOAA does take a stand on tweeting, I hope they see the value of encouraging its use with other communication avenues. 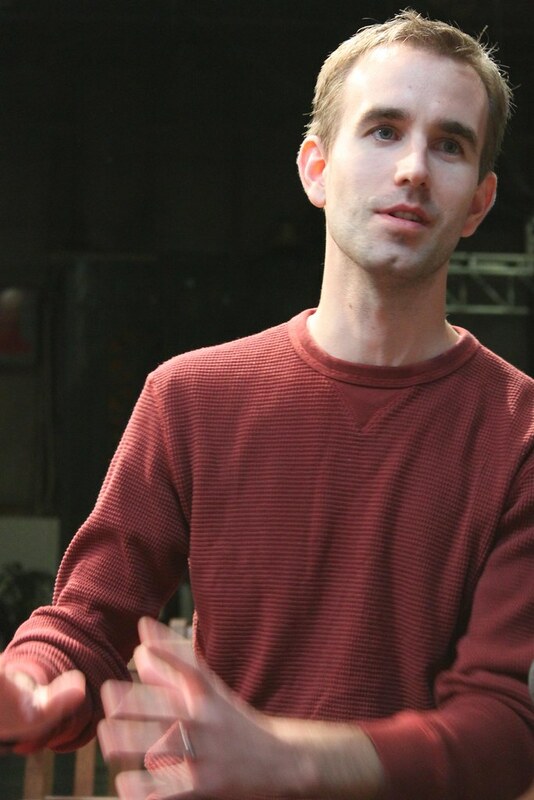 Brian: Thank you very much for doing your best. Where I live in Brookings-Harbor, people were informed enough about the tsunami to take proper precautions. People could get the information from the NOAA Website by computer, as I did. I enjoyed seeing the model with the time and water level estimations for the areas affected. It was a relief here that there was no need to blow the Tsunami Horn here. I love it that the tsunami buoys are set in proper places in the ocean and data from them can be collected to plot its course. This is a vast improvement from long ago before computers were used. I remember long ago how everyone stood on a hill waiting to see a tsunami, but it was only about 6 inches, and people were disappointed. It is interesting that e-mail and Twitter were used to communicate with people about the progress of the tsunami. I thought just the Coast Guard, Port, Fire Hall, Police, and City Hall were informed, as well as TV and local Radio, and they took care of the community. I am grateful that you and others took extra effort to protect and inform people of the hazard. GeoSpace is a blog on Earth and space science, managed by AGU’s Public Information staff. The blog features posts by AGU writers and guest contributors on all sorts of relevant science topics, but with a focus on new research and geo and space sciences-related stories that are currently in the news.